Fuzzy the guinea pig is sure that this is his year. Former Class Pets president Geronimo the rat has retired to a farm, and Fuzzy is ready to lead the club on scads of exciting adventures. Then he meets Evil With a Cute Pink Nose — otherwise known as Cinnabun, the newest class pet. Next thing Fuzzy knows, his fellow pets have elected this terminally cute creature as club president and he’s out in the cold. Reeling from the blow, Fuzzy scrambles for a solution. 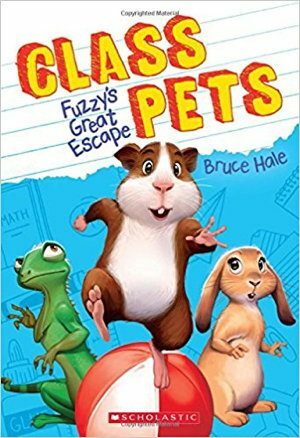 Somehow, he gets himself named as the club’s new Director of Adventure, and Fuzzy decides to take his fellow pets on a field trip they’ll never forget. And if the adorable Miss Cinnabun should happen to get lost while they’re out in the big bad world, well . . . so much the better! Return to Class Pets Series.